The discussion involving David Wright's 2012 season has always been about two things: (1) how the moving in of Citi Field's fences will affect his game, and (2) whether or not the Mets will trade him at the deadline. 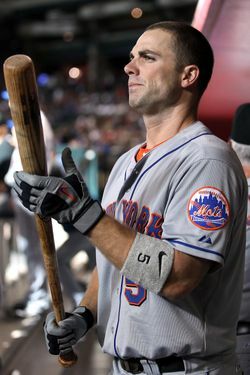 But with his broken pinkie keeping him out for two games now, there seems to be only one Mets–David Wright story: How freaking awful is the Mets' offense without him? We wouldn't have thought the Mets' O would totally collapse without its third baseman — some projection systems, in fact, had him ending the season with only the third-most homers on the team — but then again, we didn't realize Ike Davis would start so slow, Lucas Duda would prove (so far) only able to hit homers and nothing else, and that Jason Bay ... oh, Jason Bay. The Mets were shut out by Stephen Strasburg and company yesterday, but they might as well have been shut out by a third-grader: The Mets offense is looking rough without Wright. The Mets' 3-4-5 men with Wright out, Duda, Davis, and Bay, are batting .136, .050, and .158, respectively. That is a lousy way to win baseball games. Right now, the Mets' two best hitters are Ruben Tejada and Josh Thole. It's fair to say that's not necessarily sustainable. Davis, assuming his not–Valley Fever didn't take away all his abilities, will be fine, and Duda's power will always be around, even if the average remains somewhat low. (If not that low.) But even though he has the highest average of the three, no one looks more lost than Bay, who has struck out in eight of his nineteen at-bats and seems to hit harmless pop-ups when he does make contact. Manager Terry Collins, who was thrown out yesterday "defending" Bay, has admitted that it might be time to make a change, whether it's dropping Bay in the lineup — or even more drastic measures. Only $36.25 million left to go, folks. But it's really all about Wright, and there's some good news in that regard — at least if you believe the manager. Wright's finger, perhaps having watched the past few games, could be well enough to go Friday. That's probably optimistic — he's seeing a specialist today — but at this point, the Mets are already desperate. That offense is difficult to watch right now. That said, the Mets are still in first place. So take that.